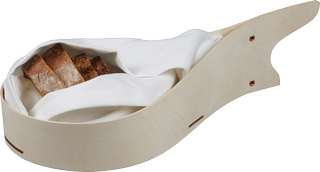 Simple and elegant storage for your bread which allows you keep it in the bag until you serve it. Birch plywood. Pinched bentwood series. Bag made of polyester and cotton. Handmade in France. L 46cm x W 22cm x H 13cm.